2000 B.C. TO 1 B.C. The Wallace Ruin site is a multi-storied Ancestral Pueblo near Cortez, Colorado. The site produced projectile points from both Early and Middle Archaic periods and later period Basketmaker II and III and points from all three Pueblo periods. This side-notched point was found during excavation at Wallace Ruin by Bruce Bradley. He identifies this point "as one of about eight or nine point types that represent the prehistoric development on the Colorado Plateau of southeastern Arizona, northwestern New Mexico, southeastern Utah and southeastern Colorado. An Archaic sequence is seen that has been termed the Oshara Tradition. This was a high desert plateau hunting/gathering tradition that shows some relationship to the lower Desert Archaic and the southern Great Basin Archaic. 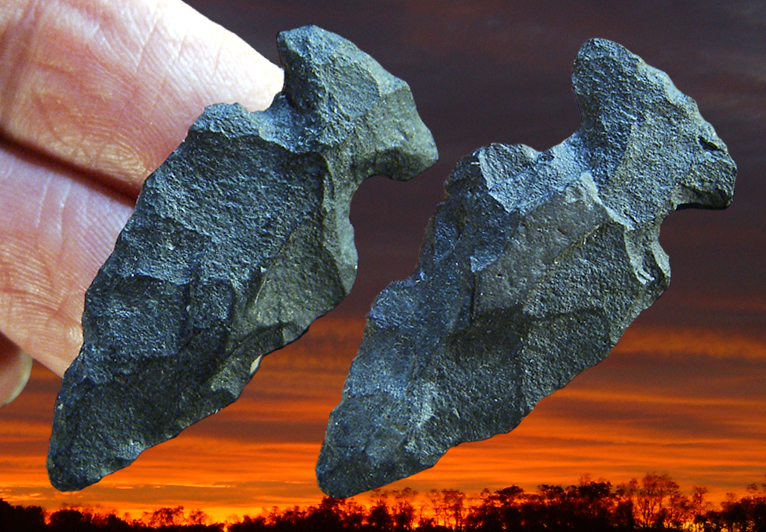 This side-notched point is believed to date sometime between 2000 B.C. to 1 B.C. It's made of Basalt and measures 1 9/16 inches (3.9 cm) long.